It’s become customary for me to summarise what each new GPIO Zero release brings. This one’s been a long time coming. It’s been a quite while since our last release (a whole year since the last point release and 18 months since v1.4). I mostly attribute the lack of development to the launch of my other project, piwheels. I think that was time well spent, but I’m sorry to say that GPIO Zero hasn’t come along as far as I’d hoped by now. But hopefully you’ll find the contents of this release to be a satisfying step in the right direction. You can see the summary of what GPIO Zero v1.5.0 brings in the changelog. I’m pleased to say it’s the longest changelog entry to date – lots of fairly small changes, plus some pretty big (under-the-hood) ones thrown in for good measure. The Pi Hut’s 3D Christmas tree board Rachel designed is now natively supported, so you don’t have to create your own LEDBoard with all the pins. Since TonalBuzzer has a value range from -1->1, where -1 is an octave below its mid tone, and 1 is an octave above (by default), that means if you set its source to come from a device whose values are -1->1 you can control its full tonal range, and a device with range 0->1 can control from its mid tone to an octave above, but either way can be effective. Since sin_values outputs values from -1 to 1, it’s a perfect example (as is cos_values). You can use source_delay to speed up or slow down the rate it iterates over the values. Speaking of DistanceSensor, we had identified issues with the distance it reports. Our implementation is complex and uses threading. The inherent complexity is essential for the device to work with other GPIO Zero devices, and without requiring blocking other code from running or using up 100% of the CPU. However, where there is complexity there is scope for bugs. Thanks to some clever work from Dave, we now use timing information provided by underlying drivers, so that timing events from pins will be considerably more accurate (see #655). Also, Dave found that the default pin library, RPi.GPIO, would often miss edges during callbacks, which threw off the timing, so we now drop missed edges and get better accuracy as a result (see #719). We recommend using the pigpio pin factory for the best results, particularly with Pi 1 or Pi Zero. Import time is massively reduced – we used to do an expensive pin factory computation at import time, but we removed that due to pkg_resources being slow as hell. It’s now possible to import gpiozero without a valid pin factory, or any environment variables set. RGBLED now supports colorzero, which is an awesome module previously buried in picamera, but I persuaded Dave it would be a useful as a separate library. It’s also used by Dave’s Sense HAT library pisense. Anyway, now you can now set the colour of an RGBLED using e.g. Color('purple') and do lots of really useful colour manipulation such as gradients. And it opens up the website pinout.xyz in a web browser. 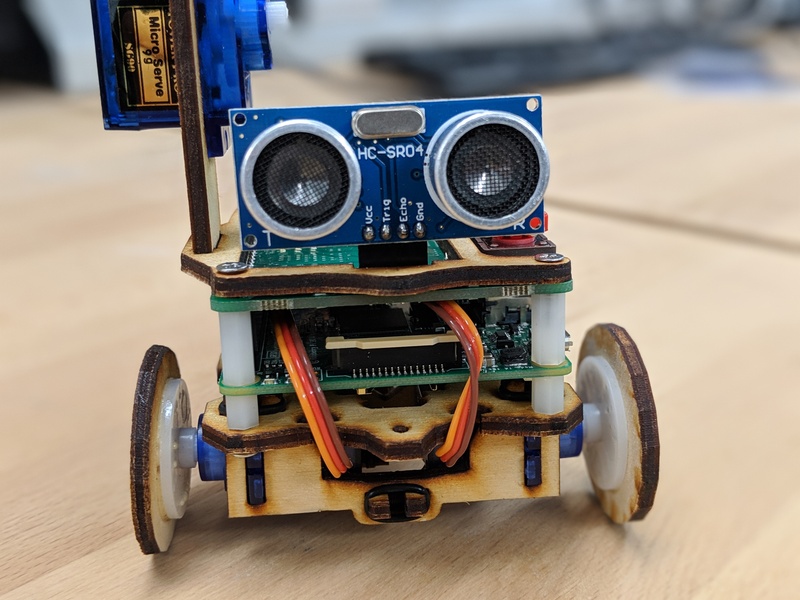 Now, back to piwheels for a brief spell – we have some awesome stuff in the works – all to be revealed soon – not least the expansion to Python 3.7 for Raspbian Buster – but more on that soon. Then once that’s out the door, back to GPIO Zero. I am planning on upping the release cycle back to one per quarter, like in the good old days. You can count on it! 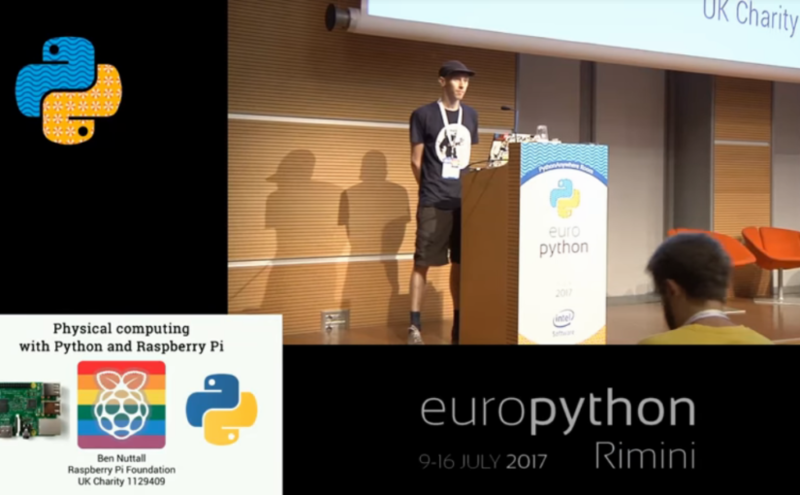 I’ve been lucky enough to have been able to attend (and speak at) two great Python conferences – EuroPython and PyCon UK – (almost) every year since 2014. 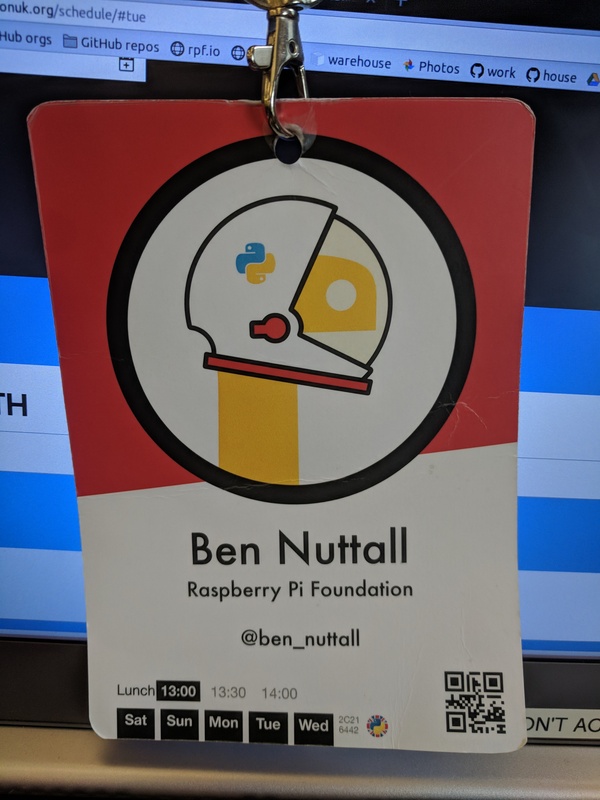 I’ve been to EuroPython in Berlin, Bilbao and Rimini, and this year it came to the UK – specifically, the beautiful city of Edinburgh. The talk I developed for this year’s conference season was entitled Programming paradigms for physical computing and IoT. It introduces four programming concepts I feel are necessary for writing effective and meaningful code for describing how devices behave. And part way through a very busy week of PyCon UK, in between running the education summit, presenting my poster, giving a lightning talk and my scheduled talk, I was announced as one of the recipients of the John Pinner Award, which was a really nice way to be recognised by the community that’s given me so much. Thanks to Daniele, Peter, all the other organisers and congratulations to all other recipients. The recent announcement of the latest release of the Raspberry Pi Desktop x86 image alongside Raspbian Stretch for Raspberry Pi included mention of a GPIO expander tool, which was followed up by another blog post explaining how it works and how to use it. 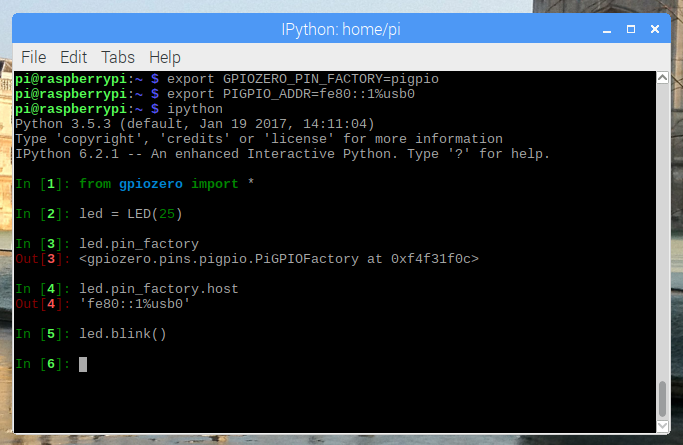 Since it uses pigpio to control the GPIO pins, that means you can use my GPIO Zero Python library to use it. 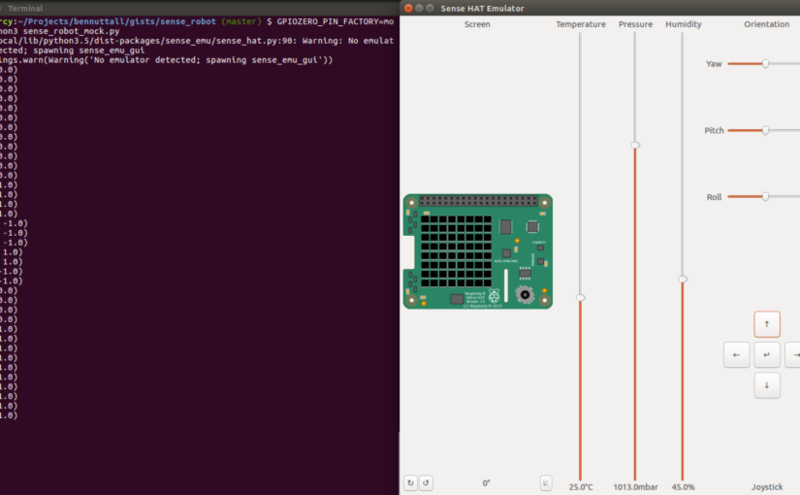 And as of yesterday, you can easily set this up on an Ubuntu PC, not just Raspberry Pi Desktop. 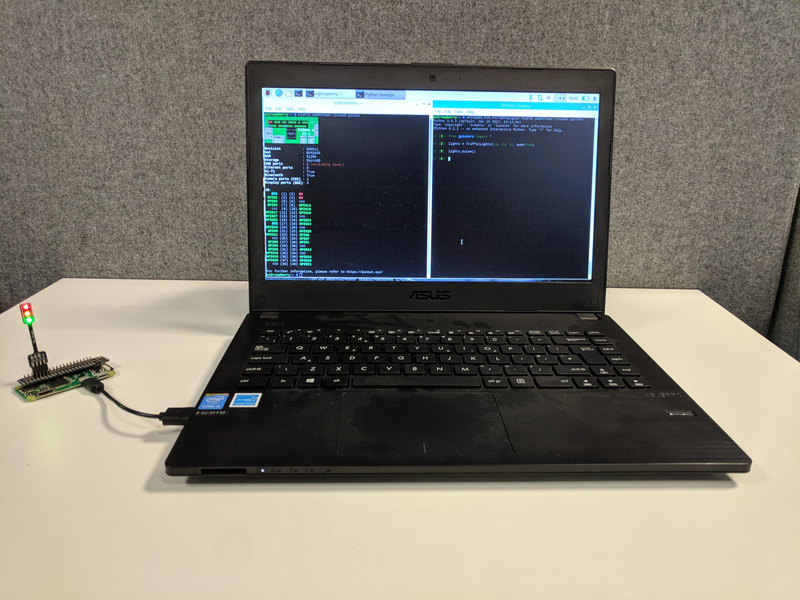 The GPIO expander tool means you can connect a Pi Zero or Pi Zero W to a regular PC with just a USB micro cable, no SD card required, and control the GPIO pins. It currently works on Linux only, but support for Windows and Mac should be expected … at some point. For now, if you don’t use Linux, you can live boot the Raspberry Pi Desktop x86 OS from a DVD or USB stick, and do it from a Windows PC or a Mac, but eventually it should be possible to do natively from those operating systems. The Pi Zero features a USB OTG port, allowing you to boot over USB from a PC. Your PC sends the required boot firmware to the Pi over the USB cable, launching a mini version of Raspbian and booting it in RAM. The OS then starts the pigpio daemon, allowing “remote” access over the USB cable. You can download an ISO of the Raspberry Pi Desktop OS from raspberrypi.org which you can write to a USB stick or burn to a DVD. This must be the Stretch release, not the older Jessie image. You can use these to live boot your PC or Mac into the OS (select “Run with persistence” and your computer will be back to normal afterwards). The OS comes with everything you need, ready to go. 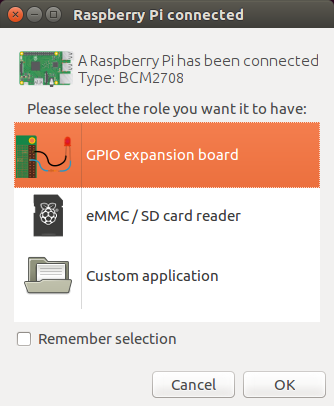 Plug in your Pi Zero, and you’ll be prompted to select a role for the device. Select GPIO expansion board and continue. It will take 30 seconds or so to flash it, then the dialogue will disappear. Now when you plug in your Pi Zero, you get the dialogue as above. Looking at the output of ifconfig, and you’ll see a new ethernet connection with an IPv6 address. On Raspbian and Raspberry Pi Desktop, this will be usb0. On Ubuntu it’s some silly string (mine is enp0s29u1u7i2). 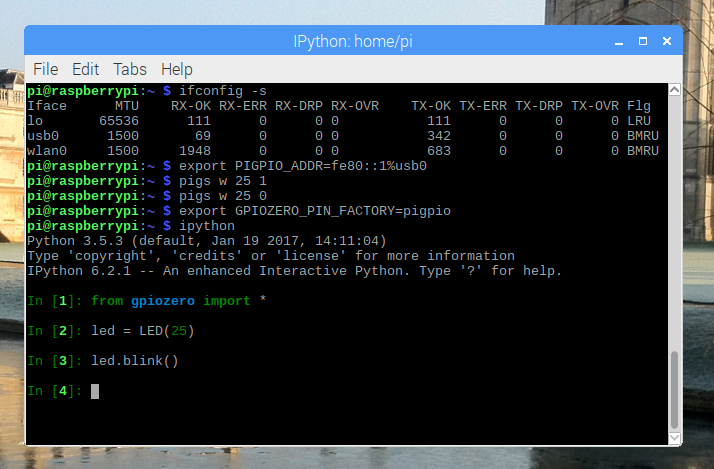 For a while now, GPIO Zero has supported using pigpio as the back-end. 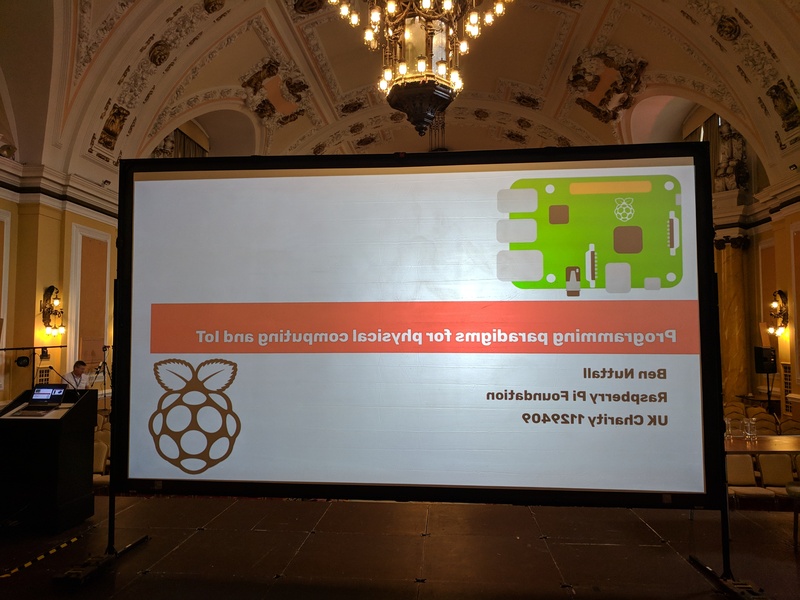 This meant you could connect to a Pi on the network from a PC or another Pi, and even control multiple Pis from the same script, but that required the remote Pi to have an SD card and Raspbian running, and the pigpio daemon running, and allowing remote connections. Similarly, Pi Zero OTG mode was possible, but that also required an SD card, and lots of configuration. In theory, this should work for multiple Pi Zeros. However, it seems there’s an issue with the USB boot tool, knocking the first one out when you add a second. On Raspberry Pi Desktop each Pi comes up with an enumerated name (usb0, usb1, etc). On Ubuntu mine were enp0s29u1u7i2 and enp0s29u1u8i2, but they’re easy to look up in ifconfig. But as I say, it doesn’t work yet. The major limitations are that you cannot flash code to the Pi Zero, and that not all software is supported. 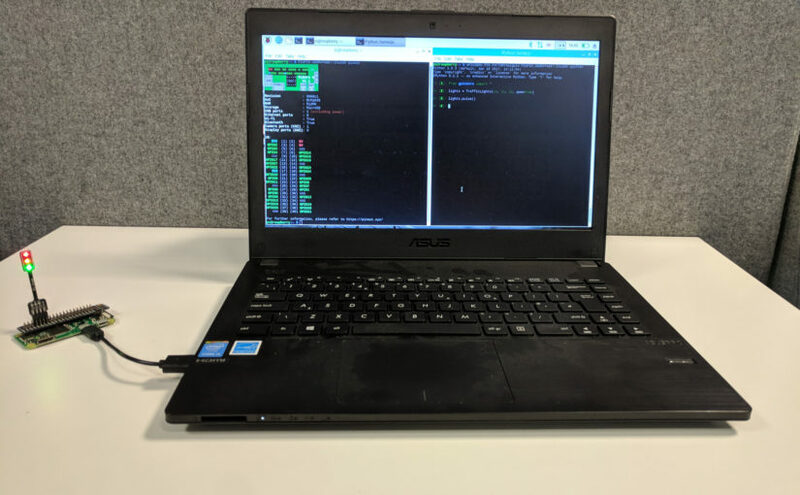 Since the Pi Zero has booted from your PC, as soon as you disconnect it, any running programs will terminate. There’s no way of keeping a battery attached, or anything like that, so you can only prototype your ideas with it, not deploy any finished projects to it without transitioning to the regular SD card setup. Also, since GPIO access relies on the pigpio library, only software compatible with pigpio will work. Since GPIO Zero features multiple back-ends (you can use a number of different low-level pin libraries to do the GPIO stuff but the API for the code you write remains the same), and supports pigpio, then anything in GPIO Zero will work just fine. However, things like Pimoroni’s extensive collection of HATs, which are written using libraries which do not support remote GPIO, just direct GPIO/SPI/I2C, will not be compatible. If you have GPIO software which is built on top of RPi.GPIO, wiringpi, spidev and others, you will need to re-implement to use pigpio in order to gain support for the GPIO expander. This includes the Sense HAT. Also, the Scratch support is currently limited to Scratch 2. While Scratch 2 is a better and more modern interface, some people prefer Scratch 1 as it’s much faster (hugely optimised Smalltalk vs. late Adobe Flash port). 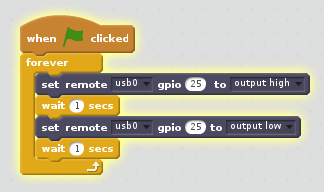 In theory, Scratch 1 should be able to access Pi Zeros using this method, as it also uses pigpio for GPIO. However, it seems to be hard-coded to use localhost, and the code doesn’t seem accessible. Perhaps this will be addressed in a future release. 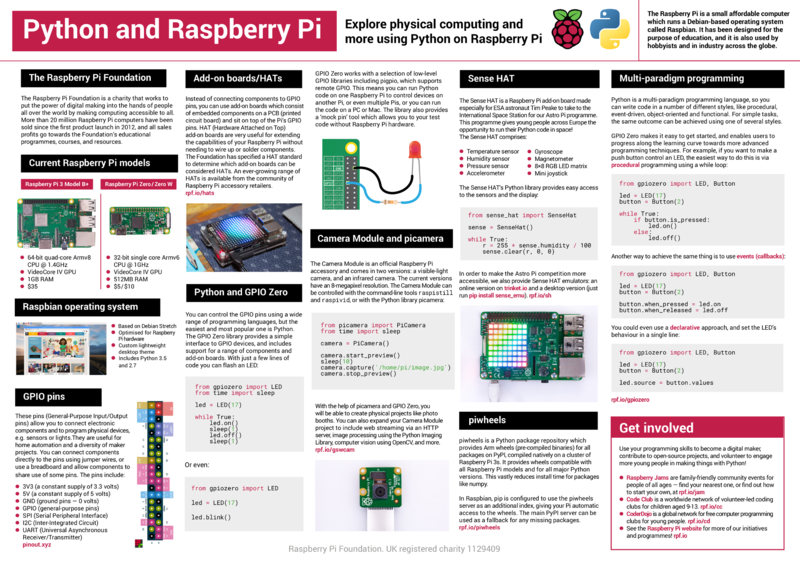 This is a real game changer for Raspberry Jams, Code Clubs, CoderDojos and use in schools. You can live boot the Raspberry Pi Desktop OS from a USB stick, use Linux PCs or even install Raspberry Pi Desktop on old computers. Then you have really simple access to physical computing without full Raspberry Pi setups, and no SD cards to configure. While preparing for a workshop last week, my colleague Marc and I started brainstorming ideas. One of the ideas I came up with was to use the mini joystick on a Sense HAT (a sensor board add-on for the Raspberry Pi) to remotely control a robot using GPIO Zero’s remote pins feature. I soon started writing the code for it on my laptop. Then I realised I could actually prototype the whole idea without touching a Raspberry Pi, using a combination of the Sense HAT’s desktop emulator developed by Dave Jones, and GPIO Zero’s mockpin interface (erm… also developed by Dave Jones). Note: I’ve turned PWM off (used for variable motor speed) here because the motors are only being driven at full speed in this case, and using PWM with mockpin would add a few lines. This opens up the Sense HAT emulator window and continuously prints the left and right motor speed values (1 is forward, -1 is backward, 0 is stopped). When you click the up/down/left/right joystick buttons, the motor values change accordingly, and when you click the middle button, it stops: (0, 0). Because remote pins only works for controlling devices available in GPIO Zero, the Sense HAT interaction has to be done locally and the GPIO stuff has to be remote on another Pi. So I create a pin factory referring to the other Pi’s IP address, and create the robot using that pin factory. This time, of course, I’m using sense_hat not sense_emu but (by design) the library APIs are identical. And now I’m seeing the robot move around for real, so I use pause() just to keep the script running instead of printing the values in a loop. While this implementation is fine, it doesn’t account for releasing the joystick (so when you press it up, it goes forward but when you release it, it doesn’t stop until you middle press the joystick which is ok but not ideal). Here we constantly check the joystick state is ‘pressed’ or ‘held’, then check the direction, and drive the robot accordingly. This leaves any ‘released’ state to stop the robot. Again, I print the value to see what’s going on.